We always listen to the noise of the fridge and it became like a common sound in our lives. We would like to consider it in a different way, in its possibility. 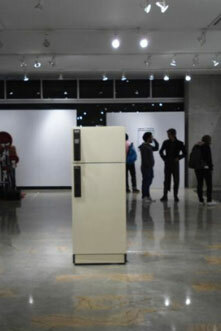 The “buzzing” that the fridge produces represents different noises playing in the same time, with a kind of synchrony. We want to deconstruct this synchrony and let it play in a relative time connection to study the interactions between parts more than sound itself. To do that we considered the partial sounds of the household appliance as if they were like subatomic particles, strictly connected the one to the other. In a relative time-space they don’t exist with certainty in defined points of time, but they show tendencies to exist. They only exist in their reciprocal relationship, but this connection is not fixed, it tended to occur. In this situation the observer becomes very important because his relative point of view can change completely the observed element, in this case the sou.